Playscapes mobile drying rack, ideal for use in schools, pre-schools and nurseries. It adds a professional and organised solution for any classroom. Art drying racks allow you to dry multiple pieces of artwork at the same time ensuring that projects do not get mixed up. Instead of crowding tables, easels or windowsills, use an art storage rack to hold paintings as they dry. Complete with 10 shelves with the option of adding an additional 10 shelves. The plastic coated, metal shelves are fully adjustable, interchangeable, and can all be removed for easy cleaning. The melamine faced MDF frame comes in a beech finish and is durable, hard-wearing and easy to clean. 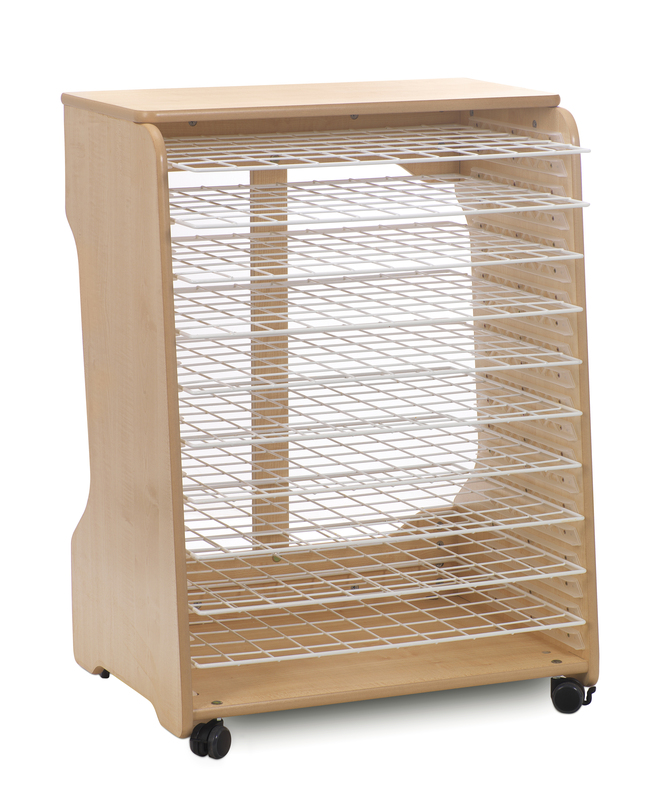 This school art drying rack is extremely durable and sturdy, weighing approximately 41kg. Each shelf can withstand up to 10kg, perfect for larger art projects. The child-friendly design features rounded corners for increased safety. Complete with 4 easy-glide, locking castors which allows the art storage rack to be effortlessly moved from room to room. With 10 racks each holding prints up to an A2 size, the drying rack frees up space and is great for minimising mess in a classroom. This PlayScapes drying rack is designed to have enough space between shelves so artwork doesn’t get damaged. Drying racks ensure there is no dripping artwork in lessons and allows work to dry quicker because there is airflow to the top and bottom of paintings. Use the top shelf for additional storage of art supplies. Fully conforms to BS EN 71 parts 1, 2 and 3, this deems it to be structurally suitable for use by children. For more information on the PlayScapes Drying Rack, please contact us or call us on 01733 511 121. Assembled dimensions: 2065mm (h) x 565mm (d) approx.